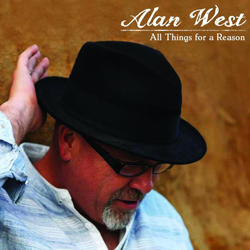 Alan West has been on my radar for several years now; with quite a few friends who appreciate quality Country music travel hundreds of miles to see his concerts; but apart from a CD a friend played on a long car journey; he has passed me by; and it’s been my loss if ALL THINGS FOR A REASON is anything to go by. While the songwriting troubadour has been on the British Country scene for a long time; this is only his third album; which probably tells you more about our fan’s snobbishness rather than West’s work ethic. Sitting somewhere between Tom Russell, Glen Campbell and perhaps Roger McGuinn Alan’s sweet voice, intelligent songs and melodies are nearly the polar opposite of the Alt. Country I normally like; but this album has been like a breath of fresh air as it came in the middle of a very mediocre run of albums to review. Several songs; and my favourites feature some enchanting fiddle playing from Justin Moses; complementing the vocals and guitar playing like a master craftsman; never intruding and always supporting. The best examples are Numbers and the Texicana influenced Maria Dolores; which was quite spine tingling. Even on the first listen; when Mrs. H was telling me something very important; the quirky Hillbilly Woodbines stood out; meaning I had to make a mental note to go back to it ASAP – which I did and it was even better the second and each subsequent play. While the majority of songs are either by or co-writes with another English Country singer-songwriter Steve Black; West chooses An odd song to cover; or is it? Take Me Home Country Roads was one of those Country songs that topped the Pop charts in my youth; before I even knew what Country Music was; and this raw, stripped back arrangement; featuring some amazing guitar, fiddle and mandolin interplay not only gives it a new lick of paint; but a whole refurbishment and is well worthy of radio play. The album closes with the introspective title track ALL THINGS FOR A REASON and it’s a case of keeping the best for last; as all that is good with this album get neatly wrapped together in one neat parcel.